Editor's Note: Welcome to my weekly editorial. This one is "humongous" so I appreciate your patience as you scroll all the way to the bottom. Catch my note at the end. "I'll rub your back if you'll rub mine..."
I think that all dancing venues (teachers and people who run dances) need to be honest or at least more public about their intentions with regard to other venues. Dan Mezrich, formerly of Swing City, referred to this as "A Code of Ethics for Dance Teachers and Organizers". Many of us talk about "community", but I'm betting most of them are not talking about the same thing and it puts some people at a disadvantage. If someone teaches classes and runs a dance, it's perfectly reasonable to assume that they're not going to allow the promotion of other dance studios for lessons. However, if such people DO promote other dance studios at their dances (including putting out flyers), I think it's a positive sign of their support for the *whole* community and we should encourage that behavior. It also shows their confidence in retaining their students. People who run dances but don't run classes need to be more forthcoming about the teaching venues they support. This is important because some dance teachers will take their students out dancing for a class field trip. This gives the dancing venues more customers, but the teachers need to make sure that it works both ways. The dancing venues need to work with the dance teachers to make sure both parties benefit from the experience. If a teacher brings customers to a dancing venue, the dancing venue should either encourage dancers to take classes from that teacher or at the very least not promote another dance studio over the field trip's sponsor (other than the person teaching the beginner lesson, that is). And if someone is teaching your lesson for you, you really shouldn't tell your audience to go elsewhere for classes; it makes them ask why you had those people teaching the beginning lesson in the first place. East Coast Swing? West Coast Swing? Lindy Hop? Balboa? Even Blues. It's all part of the same community and it's all part of the same target audience and the same customer base. All "swing" dance venues should welcome anyone teaching or learning any related form of "swing" (even "Jive"!) because it exposes more people to other variants of swing dancing and they might get some converts. As they say, "It's all swing". If you're a dance teacher and you take your students out for a field trip, check ahead. If the dance venue is not interested in giving you some support in exchange for bringing your students (i.e., "paying customers") to them, then you should find another venue for a class trip. Every once in a while I'll feel the need to explain some of my policies for this website because I'm sure that whatever I decide to do, someone's going to feel that it's unfair, usually to their disadvantage. Having it down in writing helps, I suppose, though I reserve the right to modify my policies at any time. Throughout it all, I'm only concerned with one thing: to have the most current, accurate, and complete information available so my readers can make informed decisions on how to spend their dancing dollars. This website came about because I wanted to learn how to make a website and converting my then weekly newsletter into a webpage was my excuse. The whole concept just ran away from me so now I have a lot of people faithfully checking in every week to figure out where they want to go dancing. I fumbled along trying to organize the information and kept changing the layout and the format trying to get it just right. There's only been one person running this website because some things don't work well in committee and I didn't want anyone telling me what I could or could not do with my website. One unforeseen consquence of this policy is that all incoming information passes through the same set of eyes. Yes, it's a pain to have to read everything I get which is why I came up with the guidelines for submitting information to this website. There's no automated system for entering your own information so dance organizers can't resort to underhanded tricks to give themselves an unfair advantage over their competitors, especially their technology-handicapped competitors. I won't allow any venues to describe themselves as the "best" or the "hottest" or the superlative-of-the-day because such comments might imply that they come from me and no one gets an free endorsement from me. And I'm sure no one wants to give me an excuse to dispute their "greatness", least of all in my editorial space. All information passes through the same filter so there's a level playing field, as much as I can enforce that policy. My preference is to announce new classes for the various venues all at the same time. I want dance studios to plan their schedules and present it in an organized fashion so that my readers can plan ahead of time for the sessions. I certainly DO NOT want teachers to try to keep themselves visible on the announcements page by announcing a different "workshop" each week. That's not fair to the other dance schools who are honest and play fair. You might note that I highlight some workshops in the various calendars. This promotion is for workshops given by highly regarded visiting teachers who don't live in the area and are such a big deal that dancers will schedule their lives around the workshops (for example, the upcoming Michael & Evita workshops. I just love them to pieces). Local teachers don't qualify because local students can see these local teachers anytime. It's up to the local teachers to do their own marketing. This was originally part of the section above but I realized that it was a separate topic. It's been rewritten many times over a period of...lots of hours...as the situation evolved. Do I have a bias for some venues? Do I have my favorites? Of course I do and I admit that some measure of favoritism shows up on this website. Just take a look at my sponsors list. At the same time, I also list everyone (including people I don't like) and I don't hide any information from you and I don't tell people where NOT to go. I don't mind telling people where *I'm* going dancing because I honestly don't think anyone gives a s***. And everyone should remember that my sponsors are covering this cost of promoting their competitors. You have to realize that I've been on this local dance scene for 20 years. I've seen venues come and go and I see some dance organizers working really hard to earn my support (and yours too) through all the ups and downs of the dance business. I've also seen unethical people come in and try to (unfairly) steal other studios' customers and split up the community. I've dabbled in Argentine Tango, West Coast Swing, and Hustle, and I've even tested the ballroom waters and taken a polka class (!). I was even a Square Dancer (oy!). (and it's gratifying to see that they're all as bad as the swing dance community!) However, in the end I consider myself a "swing dancer" (and not specifically a Lindy Hopper) and I support those venues that have stuck with it all these years. My two favorite places to go swing dancing are the Boston Swing Dance Network and Uptown Swing, such that I arrange my schedule around them. I've also been an enthusiastic attendee of Beantown Lindy Hop Camp for the past upteen (at least 10) years. No other venues in the area have earned my loyalty like them. Well, that's not entirely true. I think the world of Rugcutters Dance Studio because they taught me how to dance but that's another story. One thing that's been bugging me are the some subtle (and seemingly malicious) activities by some dancers to diminish, denigrate, and pretty much marginalize some dance organizers who have been working hard to build up and keep the ECS/Lindy community alive these past 20 years. It looked like they were trying to split up the community, a situation that has occurred many times in the past. If you (anyone) have an unfavorable opinion of some of the various venues in the Greater Boston area, I hope it's because you tried the venue and decided that it wasn't for you, as opposed to being told that you're not suppose to like them. It's one thing to promote your favorite venues. It's another thing entirely to tell people not to go to a different venue just because you yourself don't go there and don't want your friends to have fun without you. I especially get offended when I hear that "no one goes to that dance" and I'm one of those hundreds of "nobodies" who happen to show up at that venue. If you provide an information swing dance resource to the whole community and you leave out specific venues that your audience might want to know about, it's same thing as telling people not to attend those venues. This website is all about giving the dancers all the information and letting them decide for themselves. If someone deliberately leaves out information, their credibility as a reliable information resource is gone. On that note, there was a flyer being distributed that listed all the "blues" and "lindyhop" venues in the Boston area, all except, of course, my two favorite Lindy Hop venues (and probably others too). I found this rather offensive, mostly because it seemed to be directed at my friends, though I suspect that it affected many venues. This was hardly the act of a friendly "inclusive" community. Allowing this flyer to exist would have been considered condoning antisocial behavior. Note that I used the past tense here. Luckily various people took action to resolve the issue. "Education" was the operative word here and the situation was taken care of to everyone's satisfaction. I would especially like to thank the organizers at the Monday Night Practice and Boston Swing Central for jumping in and lending their support. PS: On a separate note, I wanted let you in on a secret. Tony and Aurelie Tye of Hop To The Beat have been teaching Balboa in the Boston area for at least the last 10 years (probably longer). And Roger Weiss (of the Boston Swing Dance Network) was probably teaching Balboa in the Boston area *before* Hop To The Beat (I was in those classes in the early 90s!). If anyone asks, these two venues (and their organizers) are definitely "balboa-friendly". And it is possible to take regular Balboa classes in the Boston area and not have to go all the way to Rhode Island or Connecticut for them. If you've been getting security warnings about the certificates on this website, it's probably okay. My internet provider recently got upgraded to officially-signed certificates (as opposed to doing their own) so any previously stored certificates will probably flag the new ones as being potentially unsafe. If you have any concerns about it, send me a screenshot of the certificate and I'll tell you if it's okay. I normally don't make a big deal about visiting instructors, mostly because I don't know them well enough to recommend them, but I've been taking workshops from Michael Jagger & Evita Arce at Beantown Lindy Hop Camp for the last few years and I think they are fantastic teachers. I've been prodding them to come up to the area since I first saw them. The first time I saw them perform was in a Charleston routine with Ryan & Jenny. You gotta ask: who's good enough to be doing a Charleston routine with Ryan & Jenny? That was the time when Ryan had an injury in the middle of the performance and so he and Jenny had to get off the dance floor. Michael & Evita didn't miss a beat and carried on the show to a successful conclusion. It was hard to tell that there was originally two couples dancing in that performance and it was a *great* performance. In the workshops, they are taskmasters. They didn't phone in their class; they worked our butts off. They worked really hard to teach the material AND to make sure you got the information drilled into you. You got your money's worth out of them. I will gladly take workshops from them as long as they keep coming up (and many of you know that I don't take workshops much these days). I hope you all take workshops with them this coming weekend (April 14-16) and see what I mean. Psst! When taking the workshops, listen to Evita talk and pay attention to her energy. Add in her height. Does she remind you of anyone? Someone commented about the "tags" I put beside some venues on various pages on this website. Since there seemed to be a fair amount of concern by at least one organizer, I assume that it's a question that others have. I think they're fairly self-explanatory. I added the tag the other week, though I'm still confused as to which venues it applies. The only one that might be confusing to my readers would be ; the definition of this one isn't really static, but it's mostly used to cover studio dances where a wide variety of music is play or it might include Country Western in addition to the other types. There's another one that I don't use much. I use this for websites that are set up on free webservers. Some people don't want to deal with websites that bombard them with ads so this lets them know ahead of time. Some browsers allow you to shut off pop-up ads so they can deal with that. However, with the shutdown of various free websites like GeoCities and AOL Homestead, a lot of those websites have gone away and have not reappeared in another incarnation. Personally, I don't think it looks professional to run a business off a free website. I also find a few websites that work *only* on Internet Explorer so I also have for people who use other browsers (FYI: I mostly use Firefox). Some venues are probably concerned that their venue don't have a tag. That shouldn't be a problem. If your venue is missing a tag, write to me about it and tell me what tag you think you should have and why. And then I'll think about it. Example: Ballroom venues won't get a or a tag. With all the listings request I get every day, I don't have the time to remember to add tags to every listing. And let's face it, if the word "Swing" is in the title of the event, is it really necessary to add the tag to the listing? My priority is go through all my listings and make sure they're still valid and I still haven't finished that task for this year yet. And then there's all those little tweaks to the HTML code. I'll add tags as I come across a particular listing that needs it or if I hear from some dance organizer. However, the goal is still the same: I want people to be able to use this website to decide where they want to go (or not go) for their dancing fix. Instead of agonizing over the tags, the venue organizers should look over their listings and make sure they're accurate. By the way, in case it isn't obvious, I do welcome comments and criticisms about this website. I'm always open to ideas for making this website better for everyone, depending on how much time and money it takes. (Many thanks to Bonnie Hale for her regular feedback). If I'm doing something wrong, I want to know about it. If a dance organizer feels slighted in their listings, they may be right or they may not understand my policies, but I'll tell you if it's intentional, accidental, or just unavoidable. You should know that whenever I'm being critical of some activity that is not conducive to a "community" setting, I try to describe it in general terms without names (though I'm sure the people involved are quite aware that I'm talking about them). The general intention to get everyone to ask themselves: "Am I do that and should I change?" My goal is "education", not retribution. I'm ready and willing to explain how I decide upon my policies, just as I'm ready to agree with you or tell you that you're way wrong. So be ready for a wordy explanation as to why I might have a different opinion and I'll expect you to defend your point of view. "Just because" is not a good enough answer. Note that, as some people have learned, throwing rocks at me in this forum is pointless; I can throw them back and I have a bigger audience. I also don't have a dance business to worry about. Anything sent to me at this website is subject to being a "letter to the editor" so please think before clicking on the Send button. Courtesy begets courtesy. And who knows? You might get me to change my mind. I like letters asking for clarifications on my policies because I assume that others will have the same questions and I can take care of all them at the same time. Last week, I wrote an explanation of how I apply the tags that associated with the different venues. I'm sure others might have noticed some discrepencies in the tags so here's a clarification. Why does Papa Joe's have a "red" WCS tag ( in the calendar) and other WCS events have blue tags ( ? Also, why isn't there a Balboa tag? Well, which tag is better? Answer: neither. The blue WCS flag is the *old* WCS flag and the red WCS is the *new* WCS flag. The two tags are graphics of different sizes. Some of the older calendar listings have the sizes defined so if I just overwrote the old image file, the new versions of the file would look weird. I didn't feel like going through all the calendars to see which listings needed to be edited. The same goes for the swing, lindy, ballroom, and every other tag. The old ones are .JPG files 30 pixels width and 15 pixels high. The new ones are .GIF files 12 pixels high. The 12 pixel high graphics generally won't be higher than the surrounding text so they can be inserted inline. It's not worth my time to go through the entire calendar changing all the existing tags; I'm just going to let the listings expire and the old tags will die of extinction. All new tags will be the newer smaller one. Papa Joe's event was added *after* I created the new tags. Hmmm....looks like Monday Night Practice won't see the new tags on the calendar until 2012 because I added all those calendar listings before I made the new tags. Definitely not going back to change those. Anything in the calendar that has red WCS tags was added after I made the new tags, blues ones were added earlier. Even if I have to make a change to an existing calendar listing, I might not remember to update the tag. Asking about a Balboa tag is like asking about a tag specifically for waltz, cha cha, rumba, foxtrot, etc. 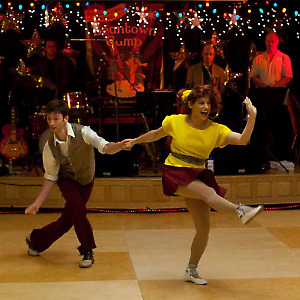 At this time, Balboa is a subset of swing dancing and you can do Bal at any swing dance. Balboa is done when the music tells you to do it, just like the music might tell you to dance the rumba instead of the cha cha (and they're basically the same body rhythm). Likewise with WCS and East Coast Swing (and even Lindy); most of the moves are the same but the music dictates which dance you'll do. If there comes a day when someone decides to run a significant dance that is *only* Balboa with only Balboa-type music, then I might consider a balboa tag. Or I might just added the text "Balboa" in the listing. Or my readers might be smart enough to figure it out. Note that there *are* waltz-only events, but I'm not going to make a special tag just for that. It's still just ballroom to me. Balboa at the Stomp....looks like Balboa. Swing City...*probably* swing and lindy. Boston Swing Dance Network...yeah, yeah. Uptown Swing...more of the same. Seaside Swing...well, could be swing and lindy, but it's really WCS so I need to highlight that. Dance Boston....huh? Could be anything, so the WCS tag is necessary. I didn't create a Blues tag until it dawned on me that Blues had reached a critical mass in the Boston area. Balboa hasn't gotten there yet. One thing to consider: all the listings are manually inserted. They're all "cut & paste". When adding new calendar listings, I usually take the lazy way out and copy an existing listing and paste that into the new dates and just change the details like the bands. If it already had tags, the tags go with it. At one point in the past, I was adding a listing for Uptown Swing and that one instance in time, I thought, "Hey, it's live music" and added the tag. I've never thought about it again after that. So...the important thing to do is to make sure you mention the tags the next time you send me listings for the calendar. Once the tags go in the first time, they *always* get added in future listings. It's too much work to remember to go back and add tags for every listing if it's not really going to help much. I will add them for any new calendar listings *if I remember*. Some of the venues that I regularly attend don't have all their tags either so others shouldn't take it personally. The tags are already added on the page of places to dance. On the calendar, the priority for the tags is to add the tags for *ballroom* events so swing dancers don't accidentally go to those venues unless they wanted to. Likewise with West Coast Swing. While I list a lot of other kinds of events, my website does focus on swing and lindy, as well as WCS, and that is my target audience (though there is a large contingent that circulates through ballroom *and* swing). While it'd be nice if I went and added all the tags, I also have to balance my time versus how stupid people are. If the listing already says "featuring...." and I bold the name of the band, it's reasonable to assume that it's *LIVE* music. Is it worth the extra effort to go back to add the LIVE tag for that? Not really. Note: there's no DJ tag. It's reasonable to assume that any listing that doesn't have any tag is going to be a DJ-only dance. Again, I assume my readers are smart enough to figure that out. If a band is listed, it's live music. If not, it's a dj-only dance. If there *is* a band and none is listed, then the venue organizer didn't bother telling me about a band and it's their problem. As I don't get paid to do all this, I have to set my priorities. I'm going to make changes to existing calendar listings if it's critical, like the time or location changed, or if the event got cancelled. If the information is already there, though implied, is it worth *my* extra effort to make the change? It mostly depends if I'm busy and if I remember or in a good mood. For all new listings, tell me what tags you think your listing should have and I'll tell you if I agree with you. PS: here's a special hint for those of you whose venues get listed in the calendar: Don't let your event fall off the calendar before sending me a list of future events. If I have to type in your calendar listing from scratch, I might honestly forget to put the tags back in. I wrote this for fun, but didn't send it in. This was in reply to an editorial in the Boston Globe written by Jeff Jacoby. I didn't think it was worth sending since it wasn't a reply to the content of the editorial and it was way too long and I didn't want to get edited, however, on the other hand, I didn't want it to go to waste and I had nothing else to write this week. I love reading Jeff Jacoby's editorials in the Boston Globe because they make me think. However, to be honest, I'm also quite often confused. Many times I agree with his comments, though more often I disagree with him. Quite often I find myself wondering if he's a Republican (probably) or a Democrat (possibly, but not as likely). In the end, it doesn't matter because his job is to provoke thought and it nudges me to *have* an opinion. However, I really would like to know his political affiliation. That would help me figure out if he really believes in some of the things he writes about or if he's deliberately writing as if to be the straight man for the opposing side of the argument. I'm find myself questioning that because if he were serious about his points of view, I thought he might have done a little more homework with regard to how some of his comments were derived. I'm disappointed to say that even *I* can find obvious holes in some of his arguments. The topic of the day was his April 17 "There's no fairness in taxing e-sales" commentary. I don't have as much an issue with his editorial leaning towards not touching the current policy of not taxing sales over state borders (if there's no local presence in the state); he probably truly believes in his point of view and that's fine. However, I have an issue with his glossing over some of his arguments. "They [the local businesses] don't charge for shipping." And the Internet businesses do. This was used to describe an "advantage" that brick & mortar stores have over Internet businesses. This is an inaccurate statement. It costs local businesses to have products delivered to them and that cost will have already been added to the final price. They have costs and they have to pass it on to the consumer. This makes their prices look higher. Internet companies don't tell you what your shipping costs are until after you've totaled up your purchase. You really don't know what your final cost is until you're ready to check out. What is the real cost of each item in your order? The Internet companies disguise the real cost of your purchase by separating the cost of shipping from the posted price of the items. This makes their prices look lower than the local businesses. Editor's Note: I do love those stores like Staples that will avoid the shipping charge by shipping it to the nearest store for pickup. Ever notice that the "shipping costs" is determined by the total cost of the purchase and not decided by the real important factor for shipping: size and weight? What we have here is a probable profit center for Internet companies; I don't think there's a real correlation between sales price and weight, the real driver for shipping prices. Personal example: I needed some "security screwdrivers" to disassemble some electronic equipment. My boss hated a certain local computer store and recommended a bulk-purchase company in California that had the product I needed. The product's listed price was $9.99. After buying the product, I found the same product in a local store for $11.99. The Internet price was cheaper until you find out that the shipping costs was $6.00 which was a lot higher than the tax I would have paid for the local purchase. That means, possibly, that the store's unit cost of shipping that item was $2.00, not $6.00. "They give shoppers the chance to see, feel, or try on items before buying them. They enable the serendipitous joys of browsing." Again, this was in reference to the "advantage" that local stores have over Internet companies. This comment presumes that all shoppers are (exactly) the same. It's true that I think that all shoppers would love to check out a product before buying it. However, Mr. Jacoby is ignoring the obvious trait of most customers in that they are also price-sensitive, especially in these trying times. What many shoppers are going to do is go to the local store, check out the product, and then run home and order it online where it's looks "cheaper". Some people do this now by driving around several stores to make sure they got the lowest price without factoring the gasoline they just wasted. The unrelated local stores end up being the Internet companies' display windows and the local companies don't make the sale. In the end, it's all about jobs and the costs of those jobs. Internet sales are done from huge warehouses with miles of shelves run by a smaller group of employees. They don't have the same labor costs. They don't have to pay the same huge amount of health insurance. They can put their warehouses in places where the land is cheap instead of downtown Main Street. There are even companies that build robots to fulfill Internet orders (at least one based in Massachusetts) so they have to hire even fewer human employees. As a result, there are fewer jobs out there and less disposable income to buy these products regardless of where they're sold. Who comes out ahead? FedEx and UPS. Proposed laws to tax Internet sales is an attempt to fix a problem (much like the proportionately higher taxes on cigarette and alcohol products attempt to do). In this case, it's the loss of taxes through a loophole. No one likes taxes, but it's more bearable when everyone is paying it. Some people don't have Internet access; some people don't even have computers and can't avoid paying state sales taxes. When some people get away with not having to pay it, others will get upset. The proposed law is an *attempt* to level the playing field so all can compete fairly and all get treated the same benefit. The new law might be implemented incorrectly but they can always rewrite it if they find that out; it's better than waiting around for all the local businesses to die a slow death. Back in the "ol' days" there wasn't much in the way of Internet sales so there was no need to regulate it. Now it's a huge part of the economy and can't be ignored. What we have ended up with is more people whining about how "unfair" the proposed law is without examining all the facts and Mr. Jacoby should include all the facts if he wants us to take him seriously. In dismissing the taxing of sales over the Internet, Mr. Jacoby shows his conservative leanings by hiding his head in the sand and saying that nothing's wrong. The problem is that there is plenty that's wrong and ignoring it won't make it go away. And if you're going to argue only one side, you have to do your homework and make sure your arguments are rock solid. Personally? I'd like to see Mr. Jacoby argue his issues from a more balanced point of view and take the time to figure out what his opponents are going to say from reading his editorials. He's not anticipating easy and obvious arguments his opponents will use against his written word; he's making it too easy for his detractors to shoot down his arguments. Having said that, though, Jeff Jacoby does a good job of poking people and shoving them off the fence. Keep it up! PS: Let's throw a wrench in there for fun. How do you pay for the maintenance of the roads that are used by the shipping companies if there is no state sales tax to go into the general highway funds?